Eidsvold, a rural town, is 160 km west of Maryborough, between Mundubbera and Monto. The Eidsvold area was explored by Thomas Archer, one of five sons of William Archer who had emigrated from Scotland to Norway in 1825. Three of the sons emigrated to Australia in the 1830s. Thomas Archer took up a pastoral run in 1848, naming it Eidsvold after the Norwegian town where the constitution of Norway was signed in 1814 and from where the Archer family had emigrated. The family's Eidsvold Homestead (1850) is listed on the Queensland heritage register. In about 1926 a local livestock agent, Martin Snelling and Co, began regional cattle sales at Eidsvold. The saleyards covered nine acres, and their success can be measured by the throughput of 7482 animals on one day in 1932. Snelling's move was well timed, as the railway line had been extended from Mundubbera to Eidsvold in 1924, and would be further extended to Monto in 1928, linking up with the line to Rockhampton. 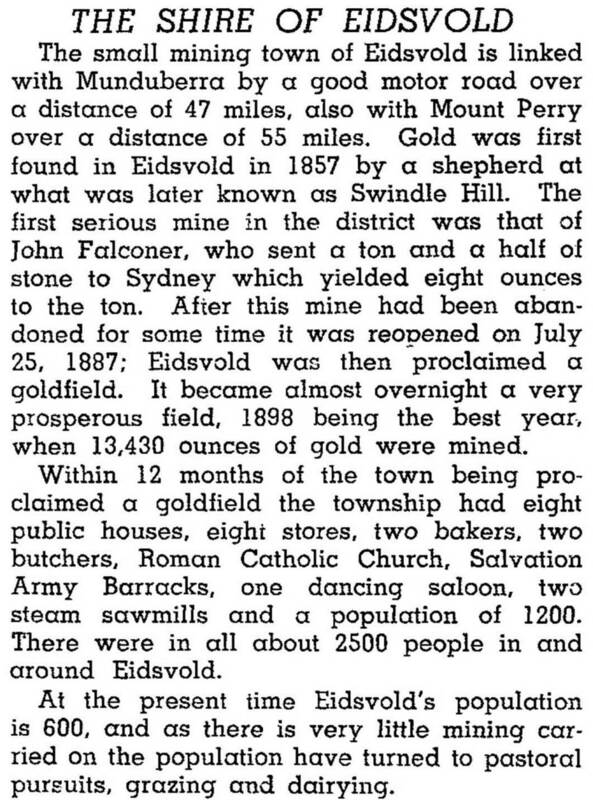 The Eidsvold Shire had an area of over 3000 sq miles, but in 1932 it was almost halved by the severance of a newly created Monto Shire. The reduced area had a population of about 1300 people in the early postwar years, falling to under 1000 by the end of the century. 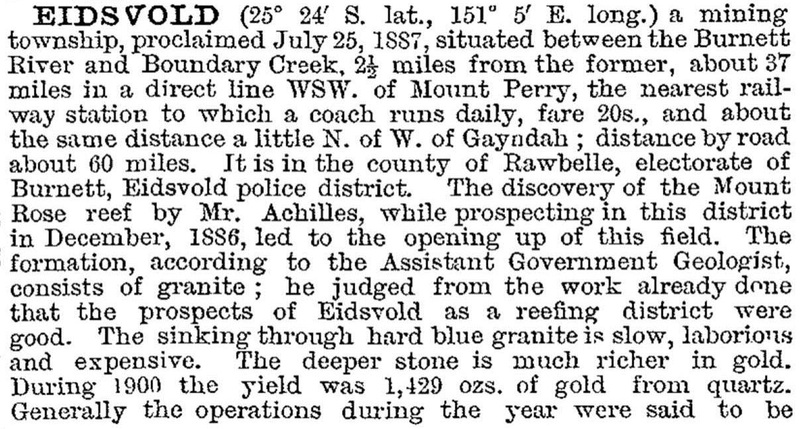 The Eidsvold township held about half the population. It has a hospital, local shops, a showground, a picnic race club, a motel, a bowling club, a golf course, a swimming pool, a combined primary-high school and a historical society. In 2008 Eidsvold Shire (4809 sq km) was amalgamated with five other shires to form North Burnett Regional Council. The shire's primary agriculture industry was beef-cattle grazing. The RM Williams Australian Bush Learning Centre (2010) on the Burnett Highway showcases local history and bush culture. An area 25 km from Eidsvold was the epicentre of a magnitude 5.2 earthquake in February 2015, the third largest recorded in Queensland (with the largest occurring in 1935 (5.5), larger than one recorded in 1883). Despite its size, no significant damage was recorded. One week later the town was damaged by flooding from Tropical cyclone Marcia. * After the severance of Monto Shire in 1932.